If you encrypt or decrypt files periodically and don’t need to automate the process in your organization, our GoAnywhere Open PGP Studio solution is perfect for you. This PGP software will protect your sensitive files using Open PGP-compliant encryption methods (like dual-key encryption/decryption) and document verification. However, if you need to encrypt or decrypt files frequently and want to reduce the time it takes through automation, GoAnywhere MFT (Managed File Transfer) can help. There are many advantages to automating Open PGP encryption and decryption. Encryption automation reduces human error, which ensures the proper selection of files and keys every time. It also keeps your data securely on a central server and eliminates the hours of manual work, troubleshooting, and other resources you might spend on encryption—depending on how many file transfers you process a week. Automatically send an encrypted file to a trading partner via secure FTP. When the file is received, an email confirmation will be delivered. Connect to a remote server, download a PGP-encrypted file, then decrypt it on your private network. Schedule Open PGP encryption, execute it interactively, or submit it from a command line. GoAnywhere’s benefits and features also extend beyond PGP automation. GoAnywhere supports detailed auditing and reporting, file transfer automation, file sharing and collaboration modules for internal and external users, file transfer compliance for data security standards like HIPAA, FISMA, PCI DSS, and the GDPR, cloud file transfers and integrations, and much more. You can dive deeper into managed file transfer in this article: What is Managed File Transfer (MFT)? 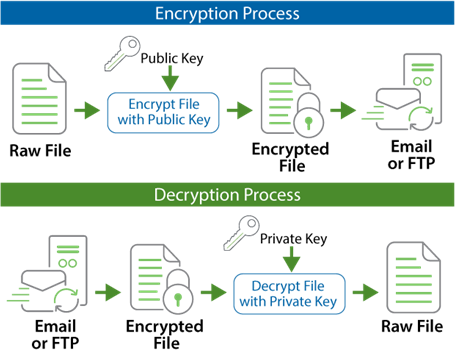 Automate your PGP encryption, decryption, and file transfer needs. Download a 30-day trial of GoAnywhere MFT to get started.